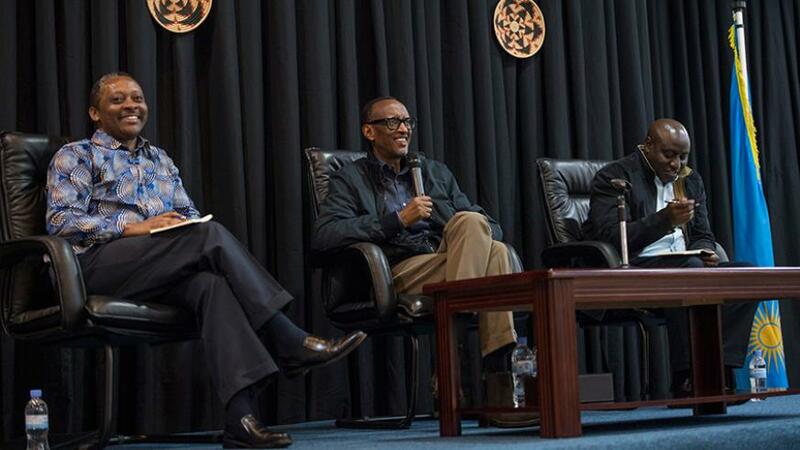 Mr Kagame was interacting with opinion leaders from the southern region (COURTESY PHOTO). KIGALI – Rwandan president Paul Kagame has challenged leaders in the Southern Province to have the right mindset in tackling societal challenges such as poverty and infrastructure deficit among others. Mr. Kagame was speaking Monday evening in Huye District, Southern Province while interacting with opinion leaders from the region. Mr. Kagame is touring the Province as part of his Citizen Outreach programme. The Head of State took issue with mindsets among some leaders saying that unless it is adjusted, progress will be hard to come by. “Leaders who are here, as long as you have not addressed the issue of mindset, we will always be taking one step forward and two steps back. That is why you receive a budget and yet we cannot see any result,” he said. For instance, he said that when addressing poverty, it should not be seen as a favour to citizens but a collective initiative for the wellbeing of all. “Addressing poverty is not a favor you are doing to our citizens. When the wellbeing of our citizens is affected, then we are all affected. People who misuse public resources think they will be better off, but you cannot be better off if our citizens are not. “If you open a shop, you want citizens to be able to afford what you sell. If everyone is living in poverty, who will you sell to? You want a viable market. Where will it come from if you have left everyone impoverished? You will end up being just as poor,” he said. According to the Fifth Integrated Household Living Conditions Survey (EICV5) launched last year poverty levels in Southern Province grew by 3.1 percent in 2017. Mindset change, he said, should also be evident through the adoption of ways and approaches to solutions. “How can you be carrying a heavy burden, and when you are offered a solution, you reject it? No one should be teaching us how heavy the burden of poverty is. What kind of person are you when you refuse to do what it takes to ease your own burden?” he said. Mr. Kagame also expressed concern on accountability and proper use of state resources meant for citizen welfare. “When you know you have the necessary, in this case, a budget of Rwf 120 billion, that money cannot just disappear, and year after year nothing has changed or improved. How can you explain this? We need to be showing the impact and change that amount has created. We cannot be like the ones who use a sieve to carry water. We have the ability to think, to do the work,” he said. He also urged them to be more involved in empowering citizens which would provide a foundation for further development. “When we talk about building our country it does not mean physical infrastructure, it means building the ability of our citizens, enabling them to improve their own life. Nothing else matters if we do not achieve this, it is the foundation of everything,” Kagame added. By taking ownership of their challenges, he said that communities will be better placed to roll out solutions that work for them as opposed to relying on assistance and intervention from outside. On the issue of political relations with regional countries, Mr. Kagame said there is no need to choose conflict when there is a peaceful solution but assured citizens that the country is not going to be diverted from the path and goals that it has set out to achieve. “No one should choose conflict when there is a peaceful solution. We will continue to choose peaceful means. But there is a line that cannot be crossed. We will not allow anyone to divert us from the path and goals we have chosen. Our only goal is to remain on the right path to transformation,” he said.